A record of Mr. J Painter donating $150 within the months of July and August. 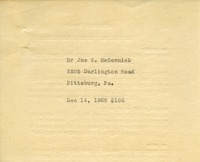 $100 and Mr. McCormick's name and address are shown. The following shows documentation of a $100 donation to Berry Schools. 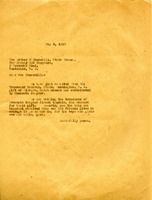 The donation was given by a Mr. H.S. 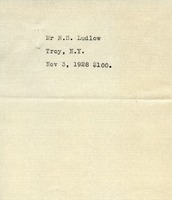 Ludlow from Troy, New York. In this thank-you letter, Miss Berry thanks the treasurer of the Monmouth Chapter and its members for sending in a gift of $100.00. Mrs. M.H. 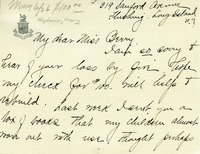 Hepburn feels really sorry about the dormitory fire so she sent $100 to help.